Aji is an English loanword from Japanese that, in the context of go, roughly means: possibilities left in a position. The go definition of aji is derived from one of aji's ordinary usages as taste, in the sense that something that has taste lingers. As such, the go usage of aji refers to lingering possibilities left in a position. These possibilities are latent and usually cannot be used immediately, but rather may come to life at later points in the game. This is why aji is also often translated as potential. A related term (that should not be confused with aji) is nerai, meaning: threat, aim, target, or follow-up. An exact definition for aji can be elusive because it is difficult to describe the concept succinctly without losing accuracy. For example, interpreting the phrase "possibilities left in a position" literally may give one the false impression that any empty corner, side, or even an empty board at the start of a game, is full of aji. Rendering the term as "potential" is likewise unsatisfactory, because this may be confused with "potential territory" or development. At least one of the groups has a weakness or defect that the opponent might exploit later. Another analogy that many people find apt is: Aji is like a stone in your shoe when you are late. The stone hurts, and as a result you can't run as fast. But because you are late, you cannot stop to take it out. Ed Lee provides another translation for aji as: funny business or unfinished business. This idiomatic rendering covers the practical usage of aji without giving into the vagueness that some see attached to other definitions of aji, especially those referring to it as lingering (or latent) possibilities. Often, bad aji means your stones have bad shape. If you have a lot of bad aji, it can result in being bound hand and foot - in other words, not able to fight with full strength, because doing so might make the aji work for your opponent. Good aji, on the other hand, usually means your stones have good shape and little or no weakness. Claiming territory with bad aji means that there are still many ways for your opponent to reduce or invade it. It has often to do with the fact that your surrounding position is thin. Doing so with good aji means the opposite. Removing the aji you have against your opponent is a bad idea, and is called aji-keshi. Removing your own aji is good, but often incurs a loss of momentum. Doing so at the right time is called honte. 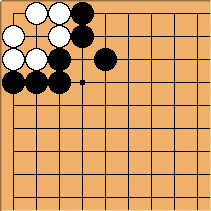 In this example, Black has surrounded White, but White is unconditionally alive (or more specifically, pass-alive). Since the White group has no defects that can be exploited by Black, it has no aji. On the other hand, Black has a thick position, connected with plenty of eyespace and radiating influence; it can be said to have good aji. 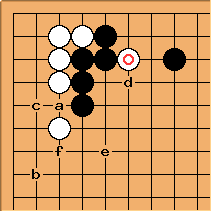 With the addition of the marked White stone, the situation changes; the position is now said to have bad aji for Black. In this case, the aji refers to the potential for White to pull out the marked stone later and possibly cut the Black group in two if the ladder becomes broken. (This could occur, for example, if a joseki played out in the bottom right corner gives White a ladder-breaker.) Black may remove this possibility at any time by spending a move at a. For White, there is a gap at a. If Black manages to get a stone around b later (perhaps as a result of fighting along the left side), he might have a chance to exploit the defect and threaten to reduce White's corner territory. However, Black will NOT want to play at a right away, as this will provoke a response at c-- which not only loses a liberty, but also helps White fix the defect. Such a play is called aji keshi (literally, "erasing taste"), because it unnecessarily removes a defect in the opponent's position that could be exploited later.